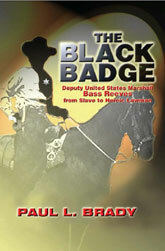 The Black Badge: The Life Of Deputy United States Marshal Bass Reeves, Paul L. Brady will keep you hanging on every word, every twist and turn in Bass Reeve's life. At a time when slavery was a very recent memory, and "Negroes" kept their place, Bass Reeves became a deputy marshal—known for his courage and skill with a gun. Unable to read or write, he would carry a handful of writs for the arrest of notorious outlaws, and always produce the right writ for the right man. He spent a lifetime upholding a legal system that failed to recognize him and members of his race as human beings, equal to whites.